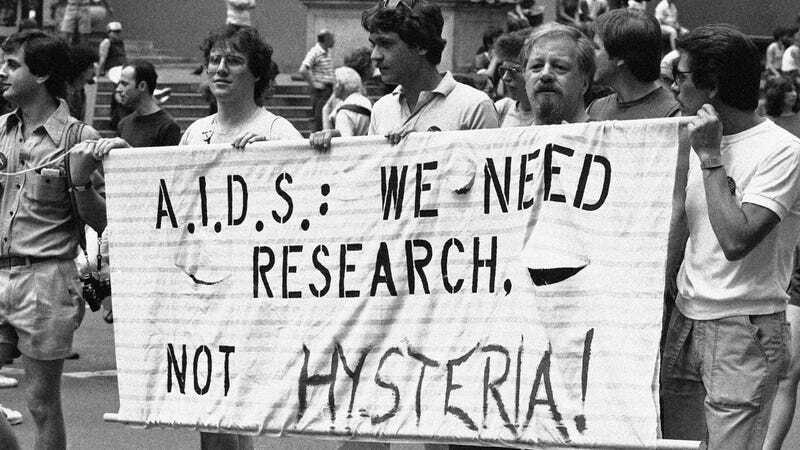 A group advocating AIDS research marches down Fifth Avenue during the 14th annual Lesbian and Gay Pride parade in New York, June 27, 1983. Photo via AP Images. Early coverage of the AIDS epidemic labeled flight attendant Gaëtan Dugas as “Patient Zero,” painting him as a sort of hyper-sexual boogeyman, creating a popular perception that he singlehandedly introduced HIV to America. A new study of blood samples from the late ‘70s confirms that he did not—the virus’s presence in America predates him. The New York Times reports on the study, just published in Nature. Researchers looked at blood samples collected in New York and San Francisco in 1978 and 1979 for hep B research, a number of which turned out to have been taken from men with HIV. That allowed genome sequencing tracing the progress of various strains of the disease, a brain-meltingly impressive scientific achievement; “Looking at these archival samples allowed us to step back in time,” Michael Worobey, the study’s lead author, explained to BuzzFeed News. The new analysis shows that Mr. Dugas’s own blood, sampled in 1983, contained a viral strain already infecting men in New York before he began visiting gay bars here after being hired by Air Canada in 1974. The study also clarifies that “Patient Zero” was essentially a typo; in early studies, Dugas was actually “Patient O,” meaning “outside Southern California.” But the phrase stuck thanks to publicity around Randy Shilts’s 1987 bestseller And the Band Played On, and further coverage turned Dugas—who died in 1984—into a villainous stereotype in the popular narrative of the disease. (In fact, this was what made “Patient Zero” into an epidemiological term.) Various researchers and advocates have worked for years to unravel the perception of Dugas, and the study provides them with still more ammunition. The study points out another yet irony: Dugas probably stuck out so much because he kept a diary he handed over to investigators, which was particularly helpful in tracing the outbreak. No good deed, as they say.